I learn some remarkable things about my son, from my son. Sometimes I learn about him from the recycle bin or from his school folder. Write a letter to yourself describing one important goal that you want to complete this year. Outline the steps that you need to take to reach your goal. Also, state the people that can help you if you have difficulty with your goal. my goal is to stop my habit. 1. do something that takes my mind off of it. 2. when I feel like doing my habit, do something else like chew on my gloves. the people that can help me are my mom, dad, sister, doctors, and other people in my family. I was quickly humbled, and amazed. Ryan’s “habit” — a facial tic where he scrunches up his face and moves his lower jaw — has come and gone in recent months, but never completely disappeared. We thought it was caused or exacerbated by medication, so we took him off. The tic didn’t disappear, and his focus at school suffered, so we put him back on the medication. The psychologist he works with told Ryan he thought it was a habit, not a tic, and therefore something completely in Ryan’s control. Following that visit its frequency dropped remarkably, but it has since returned to previous levels. Buoyed by Ryan’s ability to control this behavior, even a temporary basis, we have tried to encourage him to remember that is something he has the power to regulate. We use the language of his social skills group — of expected and unexpected behaviors, of giving off positive and negative impressions — but we haven’t had the success that one visit to the the psychologist had. I have to admit, it has been frustrating. When we remind Ryan that he is doing his “habit” excessively, he always responds that he is trying to stop, and then usually continues to do it at the same pace. This is another of those “for him or for us” dilemmas. This behavior bothers us more than it bothers him. At the same time, it is something that makes him stand out in a way that most will perceive as negative and we fear it will lead to him being ostracized and further socially isolated. If it truly is a habit that he can control, we want to do everything we can to help him do so. When we are in the midst of these discussions, all the while the habit is continuing, I have sometimes told Ryan that I didn’t think he was really trying to control it. 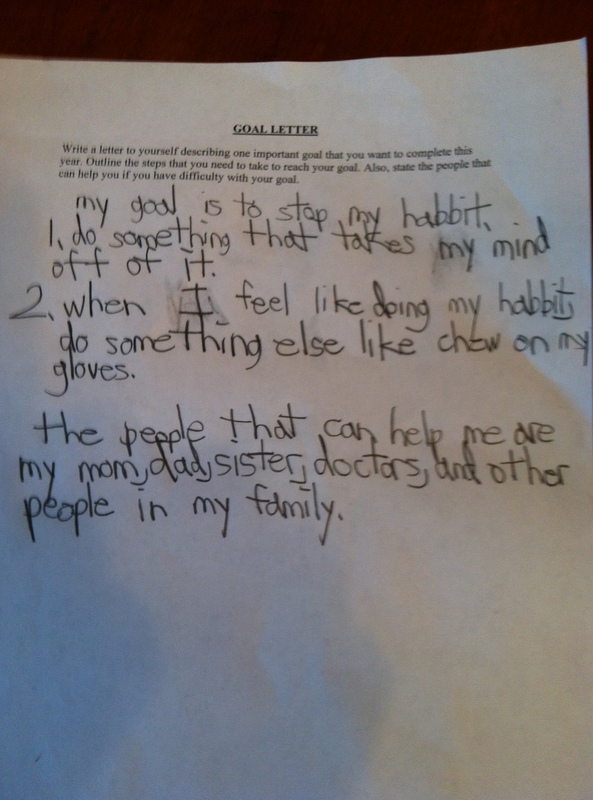 After reading his goal letter, I know I am wrong. And for that, I am disappointed in myself. Ryan taught me a lot with that brief letter, written for one of the special ed teachers at his school. He has taken in everything he has been told about people’s perception of his habit. He doesn’t want to be perceived negatively. At the same time, he recognizes that he needs a coping strategy to control this behavior. And he has also given us some insight into the facial habit being connected to his oral fixation. In other words, he gets it. The question is, do I? Your “enlightenment” really kicks you in the gut sometimes doesn’t it. Parenting is not easy and the handbook changes constantly. As he grows, changes and adjusts so will all of us. Because that is what families that love each other do.